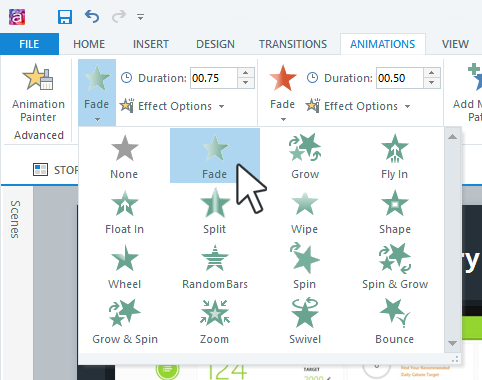 If you're importing content from PowerPoint that already has animations, this tutorial explains how PowerPoint animations are handled in Storyline. Select the object and go to the Animations tab on the Storyline ribbon. Click the star icon for the type of animation you want to add (entrance, exit, or motion path). Tip: An object can have one entrance animation and one exit animation, but you can add multiple motion path animations to the same object. Entrance and exit animations default to a duration of 0.75 seconds. Motion paths default to 2 seconds. But you can make them faster or slower. Just enter a time in the Duration field for the entrance, exit, or motion path animation, or use the arrows to increase or decrease the time. The duration can be as fast as 0.1 seconds or as slow as 59 seconds. You can tweak the behavior of most animations by choosing Effect Options or Path Options. Many animations let you choose their direction. Some let you choose a shape, number of spins, or number of spokes. Many can be combined with Fly In or Fly Out animations. Just select a direction from the Enter drop-down. If an object has text, you'll also see Sequence options, letting you animate the text As One Object or By Paragraph. Many motion paths let you choose the direction of the animation. Motion paths are unlocked by default, meaning they move with the object to which they're applied. If you lock a motion path, it doesn't move when you move the object. You can still drag the motion path to a different location, but it'll move independently of the object to which it's applied. Motion paths start and end smoothly by default, meaning the starting and ending speed is a bit slower than the rest of the animation. This is called Easing. 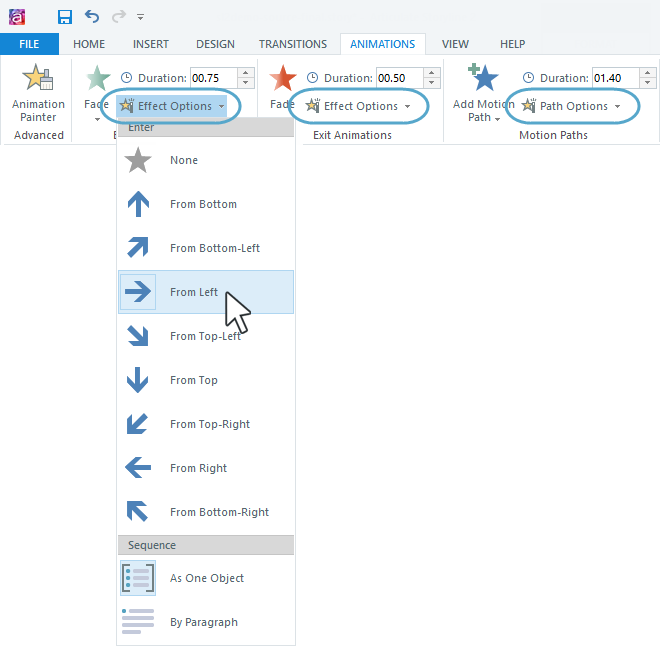 You can turn the easing on/off for the starting and ending points using the Direction drop-down, then adjust the subtlety using the Speed drop-down. If you build a motion path and later decide you want it to travel in the opposite direction, select Reverse Path Direction. Motion paths also support relative starting points, meaning you can add more than one motion path to the same object and have each begin at the new location of the object, based on previous movements. Just choose Relative Start Point. Need to use the same animations on several objects? Save time by copying animations from one object to another with the Animation Painter. Select the object that has animations you want to use. Go to the Animations tab on the ribbon and click Animation Painter. Click another object in your course to apply the animations to it. Tip: If you need to apply the same animations to multiple objects, click the Animation Painter twice to keep it turned on. When you're finished, click it again to turn it off, or press the Esc key on your keyboard. To animate the elements of a grouped object or the answer choices for a question slide individually, open the timeline. Click the triangle beside the grouped object or block of answer choices to expand it, then apply animations to each item separately.